One might think history would be trivially easy, given how these days every fact is on the Internet at the tips of our fingers. However, being a historian still takes effort, perhaps even talent. Why? The answer is simple: “the value of education is not the learning of many facts but the ability of the mind to think”. I’ll let you try and search to figure out the person who said that. A historian is trained to apply expertise in thinking, run facts through a system of sound logic for others to validate, rather than just leave facts on their own. It is a bit like a chef cooking a delicious meal rather than offering you a bowl of raw ingredients. Analysis to get the right combinations of ingredients cooked together can be hard. And on top of finding the results desirable, we also need ways to know the preparations were clean an can be trusted. Take for example a BBC magazine article written about long distance communication, that cooks up a soup called “How Napoleon’s semaphore telegraph changed the world”. The last stations were built in 1849, but by then it was clear that the days of line-of-sight telegraphy were done. The military needs had disappeared, and latterly the operators’ main task was transmitting national lottery numbers. The shortcomings of visual communication were obvious. It only functioned in daytime and in good weather. First point: Line-of-sight telegraphy is still used to this day. Anyone sailing the Thames, or any modern waterway for that matter, would happily tell you they rely on a system of lights and flags. I wrote it into our book on cloud security. The BBC itself has a story about semaphore adoption during nuclear disarmament campaigns. As long as we have visual sensors, these signal days will never be done. Dare I mention the line-of-sight communication scene in a futuristic sci-fi film The Martian? Second point: Military needs are not the only need. This should be obvious from the first point, as well as from common sense. If this were true you would not be reading a blog, ever. More to the stupidity of this reasoning, the French system resorted to a lottery because it went bankrupt. The inventor had pinned all his hope for a very expensive system on military financing and that didn’t come through. So the lottery was a last-ditch attempt to find support after the military walked. A sad footnote to this is the French military didn’t see the Germans coming in latter wars. So I could dive into why military needs didn’t disappear, but that would be more complicated than proving there were other needs and the system just wasn’t funded properly to survive. Third point: Anyone heard of a lighthouse? What does it do best? Functions at night and in bad weather, am I right? Fires on a hill (e.g. pyres) also work quite well at night. Or a flashlight, such as the one on your cell-phone. Try out the Jolla phone app “Morse sender” if you want to communicate over distance at night and bad weather using Morse code. Real shortcomings of visual communication come during thick smoke (e.g. old gunpowder battles or near coal power), which leads to audio signals such as the talking drum, fog horns, bagpipes and songs or cries. Smoke, fire, light, flags – since time immemorial man had sought to speak over space. What France did in the first half of the 19th Century was create the first ever system of distance communication. Shame that the writer acknowledges fire and flags here because those are the facts we used above to disprove their own analysis (work at night, still in use). Now can we disprove “first ever system of distance communication”? I say this is hard because I’m giving the writer benefit of the doubt. Putting myself in their shoes they obviously see a big difference between the “immemorial” methods used around the world and a brief French experiment with an expensive, unfunded militaristic system. Note this is a low-cost and night-time resilient system that leaves no trace. Pretty damning evidence of being earlier and arguably better. We have fewer first-hand proofs from earlier yet it would be easy to argue there were complex fire signals as far back as 150 BCE. The Greek historian Polybius explained in The Histories that fire signals were used to convey complex messages over distance via cipher. A flame would be raised and lowered, turned on or off, to signal column and row of a letter. 6 The most recent method, devised by Cleoxenus and Democleitus and perfected by myself, is quite definite and capable of dispatching with accuracy every kind of urgent messages, but in practice it requires care and exact attention. 7 It is as follows: We take the alphabet and divide it into five parts, each consisting of five letters. There is one letter less in the last division, but this makes no practical difference. 8 Each of the two parties who are about signal to each other must now get ready five p215tablets and write one division of the alphabet on each tablet, and then come to an agreement that the man who is going to signal is in the first place to raise two torches and wait until the other replies by doing the same. 10 This is for the purpose of conveying to each other that they are both at attention. 11 These torches having been lowered the dispatcher of the message will now raise the first set of torches on the left side indicating which tablet is to be consulted, i.e. one torch if it is the first, two if it is the second, and so on. 12 Next he will raise the second set on the right on the same principle to indicate what letter of the tablet the receiver should write down. It even works at night and in bad weather! Speaking of which there may even have been a system earlier, such as 247 BCE. Given the engineering marvel of the lighthouse Pharos of Alexandria, someone may know better of its use for long-distance communication by line-of-sight. Has the point been made that the first ever system of distance communication was not the French during their revolution? I think the real conclusion here, in consideration of BBC magazine’s attempt to persuade us, is someone was digging for reasons to be proud of French militarism. Had they bothered to think more deeply or seek more global sources of data they might have avoided releasing such a disappointing article. 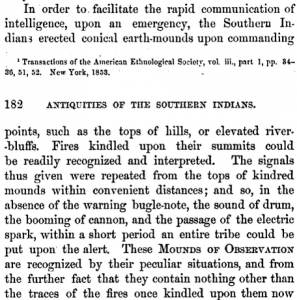 When native Americans demonstrated excellent long distance communication systems, European settlers mocked them. Yet the French build one and suddenly we’re supposed to remember it and say…oh la la? No thanks, too hard to swallow. That’s poor analysis of facts. interpretations and by so can be said that thinking and analyzing modifies also history. It is told forward how everyone sees is and story vary in forms.